Moving, had I decided to move my furniture from Texas to New York City, would have been one of the most expensive things I'd done in my entire life, coming in third after college tuition and putting down money to secure an apartment. But I decided not to move my furniture and instead buy new furniture. It was an option that still cost me a lot of money and no small amount of distress. There's a certain comfort in the things that you grew up with. My rose-covered comforter, the pink ottoman that was a gift from my father, the Japanese side table my grandmother left to me. Things that I loved to see in my room and things that unfortunately will now stay in my mother's house for—most likely—another five years. These things weren't worth the thousand dollars it would cost to move them up here, but at the same time, didn't I deserve to have the things I loved, the things that made me feel at home in the place that was going to become my new home? In the end, I decided the answer was no. I bought furniture, shipped up the art supplies and extra clothes and books that I truly needed, and resigned myself to not having those few, sentimental items. The truth is, I've never been very sentimental anyways. I'm not sure if this made my decision easier—I've always been able to live without my sentimental baggage—or harder—I love these items in a way that is incredibly rare for me. But in the end, I'll make a home somehow. Before this, if you'd asked me what home meant, I probably would have said I could make a home most places. That would be technically true. I was pretty minimalist inn college, packing nothing but photos as proof that I had any sentimental feelings at all. So I have no doubt that I'll be able to live and thrive with whatever new things I buy. But I've never been much of a hoarder, so without furniture, I have very few personal effects—no playbills or movie tickets or journals or concert t-shirts. If you Google "what makes a home," of course the first thing that comes up is "home is where the heart is." My furniture wasn't my heart. The furniture was a crutch, actually. I thought it would make my apartment a home. Sure, it helps aesthetically, which is important to me as a graphic designer. But my home being right out of an HGTV episode is unnecessary when what I'm really looking for in "home" is a feeling. The feeling I get when I lie in bed and read a book, the feeling I get when I run to the store with a friend to get ice cream late at night. It's not about the furniture, it's about comfort. If comfort is being able to find a restaurant that sells you breakfast tacos, or comfort is having the fluffiest comforter, or comfort is never having to hear your neighbors have wild parties, than that makes it home. For me, crafting a home will most likely include choosing a beautiful comforter, a set-up that makes it easy to play video games, and absolutely will include setting up a very organized arts and crafts drawer. It will also be the place where I wear ugly pajamas, and eat chips and cheese for dinner instead of cooking. I still don't know if my new apartment will become home. I hope it will, as I hope to be here for several years, but I just don't know yet. But it won't be the furniture that makes or breaks this apartment. It’ll be what I bring to the apartment that’s important to me, not just the HGTV ready interior decor. These are words for those who are wandering and wondering through the open spaces of young adulthood, words for those navigating the unchartered seas of a life all your own. Whether starting a new job or investing more in your current one, moving to a new city or creating a home where you already are, making new friends or feeling the loss of your old ones, booking that trip to Europe or only staring at a calendar void of vacation days, Windrose is for YOU. We can only ship within the United States. Sorry to our international friends! We still love you! But you can still get your digital copy of Windrose! When can I expect to receive my copy of Windrose? 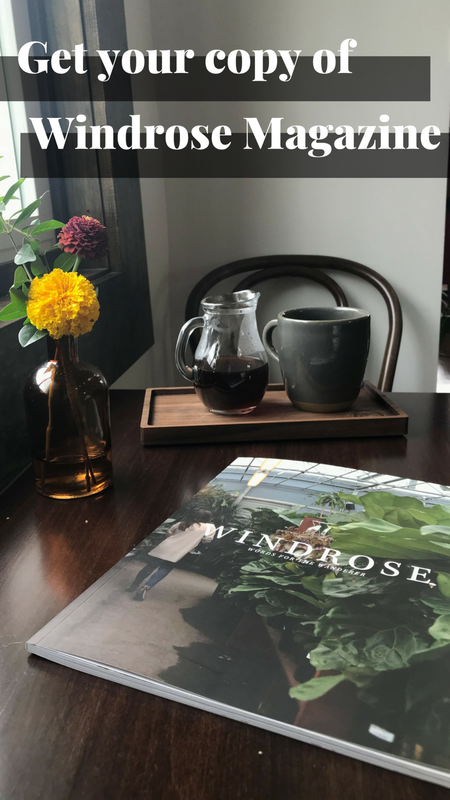 You can expect to receive your Windrose copy (or copies... order more than one!) by mid-to-late October. We will update you if this changes. How will you be shipping these magazines? We will be mailing your magazine via United States Postal Service. You will receive a tracking number once your magazine has been shipped. No returns; all sales final. Claire is a recent transplant to New York City—so recent that she still accidentally calls San Antonio home. She's a graphic designer and part-time writer, but her first love is social media and free food. Check her design work out at www.clairetorres.com or on Twitter @c_torres42.